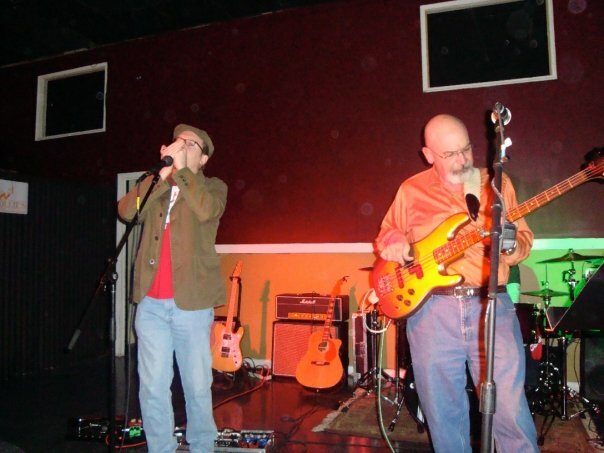 Your blogger (left) playing harmonica in a band consisting of professors and teachers. Many well-known scientists over the centuries were also musicians: Galileo was a lute player (his father Vincenzo was a famous professional lutenist), astronomer and composer William Herschel played oboe, organ, and harpsichord, astronomer Caroline Herschel was a fine soprano, Albert Einstein played violin, the famous composer Alexander Borodin was a chemist. More recently, Nobel Laureate Saul Perlmutter is a cosmologist and violinist, and the lead guitarist from the glam-rock band Queen, Brian May, has a Ph.D. in astrophysics. (Presumably May knows that it’s conservation of angular momentum, not fat-bottomed girls, that make the rockin’ world go ’round, so artistic license must be granted.) Daniel Levitin has serious music and science chops. The list goes on! If you include the musicians and composers who have found inspiration in science, whole books could be written. (In fact, I’m sure whole books have been written on this topic; I just haven’t looked for them. Leave your favorites in the comments.) The great science/art site The Finch and the Pea has a regular “song of the week” feature, and the rapper GZA of the Wu Tang Clan has a new science-themed project named Dark Matter, with contributions from Neil Tyson and others. As you can probably gather, this isn’t a regular blog post, but rather a “I’m too busy to write a real post, so here’s a fill-in” post. So, here are 10 songs (if you’re on Spotify, you can listen along to the entire set), and below that are some other links. Can you guess what’s on my mind today? Titan may have a global subsurface ocean. Bonus feature: something known as the “Love parameter”, which is a measure of how squashy a moon is. Measuring anything about the atmosphere of an exoplanet is tricky, but researchers sometimes get lucky. However, this situation may get better soon: a team of astronomers has determined a way to use the chemical signature of atmospheric absorption of light to determine the orbital properties of the planet itself. In our Solar System, there is a clear separation between the rocky terrestrial planets and the gaseous giant planets. However, that’s not the case for other star systems, and one has recently been discovered with two planets in neighboring orbits, but with vastly different sizes and compositions. I’ve named them Laurel and Hardy, but I doubt the community will back me up on it. Phil Plait (the Bad Astronomer) provides some perspective on the possible discovery of a very massive galaxy that formed too early in the history of the Universe. The verdict: it may be a galaxy, it may not, but if it’s there, it will be challenging to explain how it can exist. In honor of baseball season in the United States, Evelyn Lamb analyzed the knuckleball, one of the hardest pitches in baseball to throw and to hit. And, more from Ars Technica: hot solar vortices! twisting light to achieve terabit transfer speeds! and a lumpy early Universe! Richard Feynman was a notable drummer. I was thinking: I know of a number of violinists, organists, guitar, and lute players, but only one drummer. How many scientists are drummers? Are any well known, besides Feynman? Yes, music and math are especially closely related! He also did experiments and was the first to establish the relation of string tension to pitch, which is a square-root relation. This may have been the first non-linear law of physics. History of Science speculations of the \”like father, like son\” category are left for the reader. And Borodin not only was a chemist but differed from virtually everyone else then or later in considering his music (such fripperies as Prince Igor) a sideline to his real work. He quite annoyed his colleagues (so \’tis said), who were trying to build the Russian national style, freeing it of foreign influences, which I presume to mean French. His friend Rimsky-Korsakoff visited him one day and found him in the laboratory, busy \”distilling a vacuum into nothingness\” and was not pleased.